HAWAII IS a U.S. state located in the central PACIFIC OCEAN near the EQUATOR and consists of eight major islands: Hawaii, Maui, Kahoolawe, Lanai, Molokai, Oahu, Kauai, and Niihau; 129 smaller islands are also part of Hawaii. Hawaii is not the equivalent of the Hawaiian Islands or the Hawaiian Chain, which includes other islands, such as Midway, that are not part of the state of Hawaii. At its greatest expanse, Hawaii extends for 1,523 mi (2,600 km); it has a total land mass of 6,423 square mi (16,729 square km). The highest point is Mauna Kea at more than 13,796 feet (4,205 m) and the lowest point is at sea level. The capital city is Honolulu on the island of Oahu. 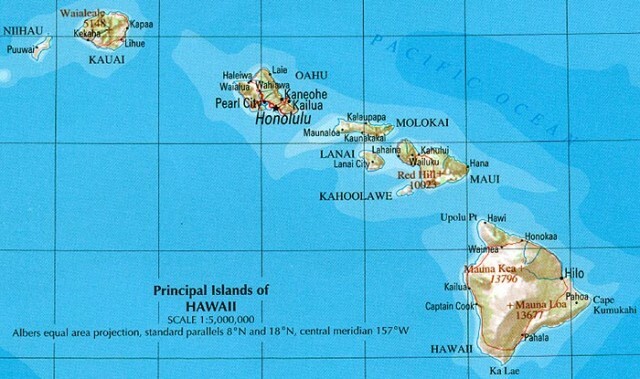 The population of Hawaii is 1,211,537 (2000 census), and its largest city is Honolulu (876,156). The state population is evenly divided by gender and has a density of 188.6 persons per square mile. The median age in 2000 was 36.2 years. The island of Hawaii is the largest of the islands and has two active volcanoes, Mauna Loa and Kilauea; it supports extensive agricultural activity. Maui is called the Valley Island because of the dominance of two volcanic mountains; while a haven for tourists, Maui also has sustained valuable production of sugar. Kahoolawe is a small, uninhabited island near Maui. Lanai is the center of the pineapple business. Molokai, also near Maui, is an island of canyons and mountains; its central region is fertile for crops. Oahu has two mountain ranges, the Koolau Range in the east and the Waianae Range in the west. While supporting an expanding metropolitan Honolulu, Oahu is an agricultural center with sugar and pineapple plantations. Kauai, known as the Garden Island, is rugged; its Mount Waialeale has the greatest rainfall (460 in or 1,168 cm) per year on Earth. Niihau is rather arid; it is privately owned by the Robinson family of Kauai. Hawaii’s gross state product in 2000 was $39.1 billion. The economy is based on tourism ( $10.9 billion), U.S. military defense spending ($4.4 billion), and the sugar and pineapple businesses ($276.1 million.) The Hawaiian state government is interested in diversifying the economy and has invested in developing science and technology, film and television production, sports, oceanic research and development, education, and floral and specialty food products. In trade, Hawaii transacted $3.31 billion in merchandise in 2000 and had exports totaling $407.7 million. Imported petroleum products provide more than 90 percent of Hawaii’s energy requirements (2000). Originally settled by Polynesians more than 1,500 years ago, Captain James Cook was the first European to visit Hawaii (1778). During the 19th century the native Hawaiian population (estimated about 300,000) was decimated by diseases imported by European and American adventurers, businessmen, and missionaries. By 1900, the native population had been reduced to about 70,000. During the same time, American immigrants overthrew the native government and moved Hawaii to annexation by the UNITED STATES. American expansion in Hawaii and the PHILIPPINES was denounced as imperialism; for the most part, American culture absorbed Hawaiian culture, although recent years have witnessed a resurgent native Hawaii culture. Americans viewed Hawaii as strategically and economically significant; the American navy centered its Pacific headquarters in Hawaii, and American businesses reaped profits from sugar, pineapple, and other fruit products. The attack on Pearl Harbor and the subsequent war against Japan led to an expanded American presence in the Pacific. During the second half of the 20th century, the United States relinquished its naval bases in the Philippines and became dependent upon Hawaii as the focal point for its Pacific fleet. Further, the naval observatories on Hawaii are important astronomical centers for research and satellite management.